Armatures are one of the most important parts of any stop motion puppet because they allow your characters to walk, wave their arms, gesture and move the way you want! This video has been converted from our DVD into a 1 Gig .MP4 for our international customers who don't want to wait or pay for shipping. Wire spring back is a major problem with aluminum wire armatures, and the methods on this video show you how lead wire armatures remove that problem completely. Many people dont know that these armatures behave the same way as expensive ball and socket armatures - there is no spring back and they move super smooth. 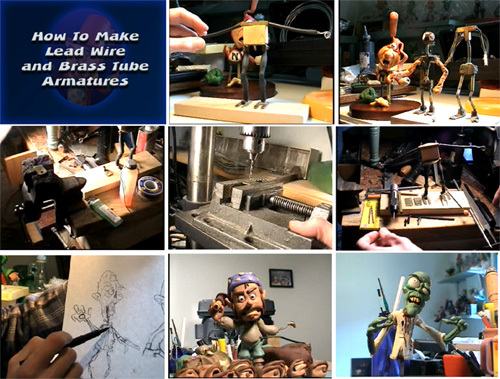 This 1:45 DVD will make it easy for you to understand all of these things in order for you to create successful armatures! So don't give up, download our video now so you can learn how to keep your puppets from collapsing and falling over! Please see our download help page if you should have any issues while trying to download our files by clicking here.